Each year SOLIDWORKS releases a new version of its flagship product. This year, during the 15 days prior to the release of SOLIDWORKS 2015 we’re taking a look at 15 of our favorite new features coming in this feature packed release. To learn more about SOLIDWORKS 2015, you can click the banner above and bookmark the launch page for when it goes live on September 9th, 2014. SOLIDWORKS Treehouse is a new standalone application for building and managing assembly structures using an intuitive and simple graphical interface. Long time users of SOLIDWORKS may remember it’s early beginnings when it was previewed several years ago. Users asked to bring this back as a full-fledged feature in SOLIDWORKS, and we listened. It works by simply dragging and dropping parts and assemblies onto one another; you can build an entire assembly structure in minutes. Each part or sub-assembly can then be edited to include custom properties, configurations, quantities and more. Drawings can also be associated to the parts and assemblies. 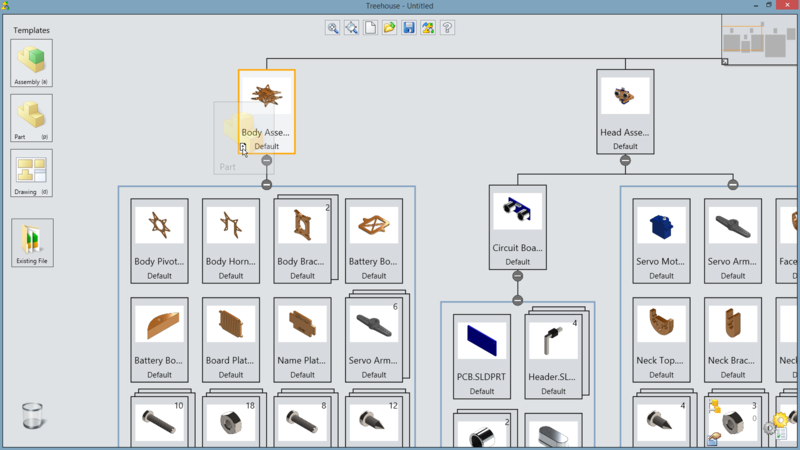 Likewise, existing assemblies can be opened in SOLIDWORKS Treehouse to view, edit and add to the structure. When complete, the entire structure can then be opened as a full SOLIDWORKS file structure. Combine this tool with SOLIDWORKS Enterprise PDM and you have a very powerful solution. 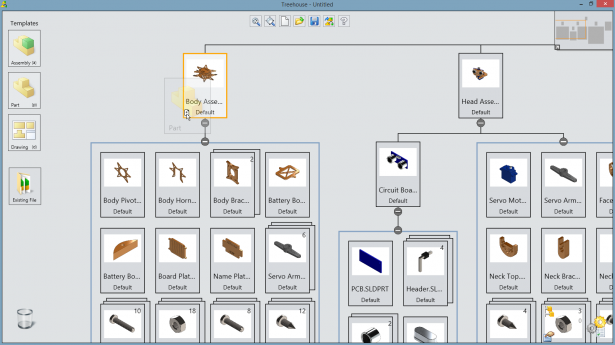 SOLIDWORKS Treehouse is an invaluable tool for those companies who build product structures upfront. Create the structure, and then use SOLIDWORKS Enterprise PDM to distribute the sub assemblies to the appropriate engineers. If you want to see more of the 15 Features coming in SOLIDWORKS 2015 blog series, you can check in on the announcement post from August 22, 2014 where we will be updating and adding links to each of these posts as they go live.